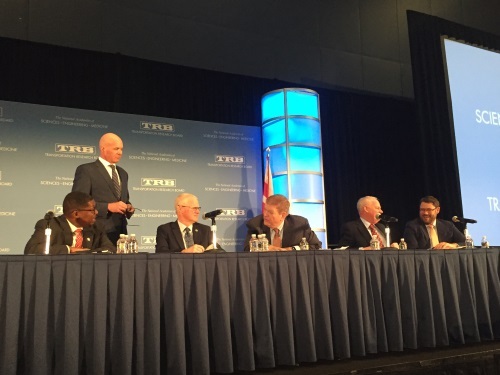 A panel of six state department of transportation executives delved into some of the issues surrounding U.S. surface transportation funding during the 2019 Transportation Research Board’s annual meeting in Washington, D.C. Sponsored by the American Association of State Highway and Transportation Officials and moderated by Carlos Braceras, executive director of the Utah Department of Director and AASHTO’s 2018-2019 president, the group focused on the difficulties of maintaining and expanding a national transportation network with a dwindling amount of fiscal resources. Utah’s Carlos Braceras is at left in this Utah DOT photo. Idaho Transportation Department Director Brian Ness echoed Wilson’s perspective on funding. “We have to get the funding right because we are in a transition point of time,” added Georgia Department of Transportation Commissioner Russell McMurry. Yet Pete Rahn, Maryland’s transportation secretary and chairman of the Maryland Transportation Authority, noted that almost all previous federal surface transportation funding reauthorization efforts have been undertaken in a “crisis” environment, to the point where many in Congress have gotten used to it. As a result, Rahn pointed out, many states are increasingly resorting to “non-traditional” methods to finance major transportation projects such as public-private partnerships or P3s.